The career exploration road map is a tool that was developed by Bill Lindstaedt and Jennie Dorman to help students/trainees visualize the career exploration process and track their progress. This tool was initially developed for graduate students and postdocs at the University of California, San Francisco, but is now available for all to use. The road map is intended to be career neutral as it is often understood that many trainees are considering both academic and non-academic career fields at the same time. 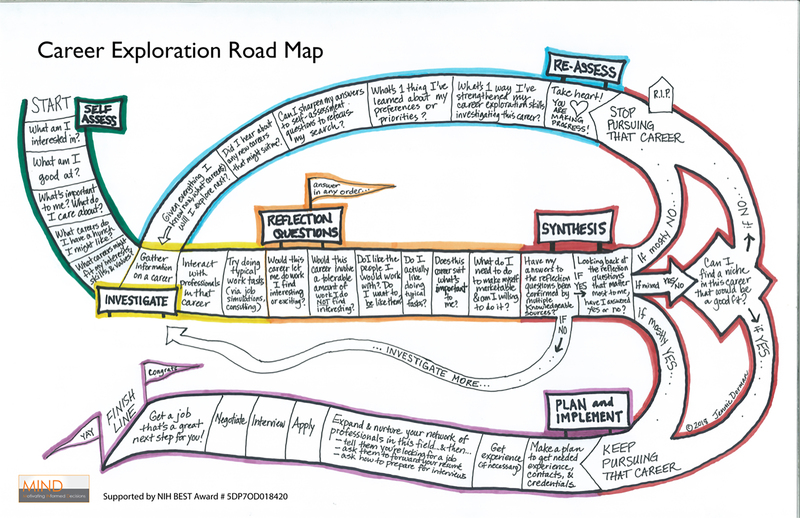 The map guides you through six different stages of career exploration with a color to match each stage. It is a board game style which walks you through key questions you should be asking yourself at every stage of the process. For example, in the first self-assessment stage, questions include: What am I interested in? What am I good at? What is important to me/What do I care about? What careers do I have a hunch I might like? What careers fit my interests, skills, and values? The creators designed this specifically to help break down the process into more manageable steps. We all know that thinking about career exploration is important – vital even – to future success, but it can feel so overwhelming and time-consuming. Career exploration and decision-making is rarely a linear process hence the map’s circular outline. You may find yourself going through each stage multiple times for varied different options. While that can feel frustrating, it is also a part of the process that helps you eliminate bad choices and zero in on good fit options. If you are feeling stuck and unsure about where to go with your career, give the questions in the career roadmap a try; and remember, if you are at the NIH, you have access to a variety of career resources and services, including many workshops/events as well as one-on-one career counseling. If the career roadmap is of interest, you might find the OITE workshop on Planning for Career Satisfaction and Success particularly helpful as well. What do you do as a consultant? There are tons of consultants in the DC area. We almost outnumber the number of lawyers in the metro area! Generally speaking, consultants are people who assist other organizations in a common goal. I assist the military health system to increase their knowledge on traumatic brain injury and psychological health issues by summarizing current scientific literature. I also convene working groups of experts to make recommendations on standards of care for a specific clinical area. Solid critical thinking skills and strong writing skills are definitely a plus. You can learn the consulting skills but you can’t learn the science skills that you get from a PhD in science. Organizational skills are important as is problem solving. Being able to anticipate problems that could arise and coming up with strategies on how to solve them. Those are a few of the top transferable skills that I am still developing. A common impression of consulting is that it is project-based, but also team based. How much of a focus is there on team or group work? There is a lot of focus on groups, but I don’t work in a group with just other PhDs. On our teams, we have people that are both senior and junior to us and the idea is to work as one entity with those different levels. You may be the only expert on a particular field of science and need to teach your team about this topic. In that same project, you may be the novice on another subject. So, it is a mix of assuming the teacher role and the student role – all within the same meeting. That is an important skill to have and something I use in my everyday skillset. I like the flexibility and the fact that it is not the same thing. Similar to grad school, there is something different daily. One day, I might write a lit review and the next day, I may attend a conference or work with our clients on a strategic plan. You are constantly using different skills, so you don’t get bored. In a similar vein to how we have to assume the role of both teacher and student, I like how I get to continuously learn about new topics. I have enjoyed learning about different areas and kind of becoming an expert in a different way than I was able to in grad school. What are some of the challenges of being a consultant? I am lucky because I don’t really have to travel with my current job. I would say I travel once every four months. However, that is a decision that you have to make if you go into consulting: Are you willing to do the Monday – Thursday travel schedule? This issue factors into the work-life balance issue, which everyone has to contend with. You have to put limitations on what you will and will not be available for and those decisions may impact your career trajectory. This is just a fact; you just have to decide what you are comfortable with and what you value. The general consulting skills (i.e. project and client management, product preparation) because you get used to the world of academia, so switching into a more professional environment is something that took a little bit of effort on my part. I was hired because of my subject background and so I came in thinking I was the expert, but I hadn’t had much experience making client-ready documents. Making things look pretty wasn’t something I was used to doing. In grad school, it is more about the content and in consulting content matters but it needs to be accessible to different audiences. To do this, you have to think about formatting and what level of language you will use. Most of the time, you aren’t speaking to other experts; you are speaking to the general public. It is a different kind of writing; it is not the technical writing that you do when writing journal articles. I graduated in November 2010 and took a little time off to finish up some work. Then, I started to research what firms were available in the area and the different types of consulting firms. I needed to decide if I wanted to go into commercial/management consulting (like McKinsey) or if I wanted to go into government consulting (like BAH). I also had to decide if I wanted to leave my subject area and go into general consulting or if I wanted to stay in my subject area and consult in that field. There are a lot of different firms and I took the time to try and get to know them. First it was identifying the target; then learning the differences within them; applying to the various companies, and finally preparing for the interviews. I went on a few different interviews, but there were two types of interviews- the behavioral interview and the case interview. The behavioral interview is more of the traditional interview where you walk through your resume and they tend to ask situational-based questions. They want to figure out if your personality and thought process are a fit for the team. Then, there is the case study interview and this can be wide-ranging. They give you a scenario and then you have to ask questions to figure out what the problem is and what you would do to solve the problem. They can also give you numbers associated with the case where you have to figure out ratios and do some mental arithmetic. For example, this drug store is having customer service issues; what percent of their profit is being affected? Then there is a subset case interview where you come in and you discuss a journal article. It is basically like a journal club. Those were the types of interviews I went through during my job search. How did you prepare for your interview? There is actually quite a bit of information online. There is a book called “Case in Point” which offers a lot of different strategies to help to prepare for a case interview. It is mainly geared toward an MBA type of candidate. It is good to help you understand what type of questions could come up and it gives you the general format of a case interview, but one thing that you have to factor in is that the book is preparing an MBA candidate and you are a PhD candidate. They don’t need you to know all these finance terms; they want you to display your critical thinking skills, so again that problem solving aspect and being able to identify a problem and organize it into some logical process in order to solve it. The other thing that I try to impress on people from NIH is that you are not interviewing with your peer group. You are interviewing with people who have no idea about the field of science. When you say I was a graduate student in this lab and I led this study, you really need to spell out what skills you used. By listing your publications, most people at NIH can look through and see what kind of a scientist you were – if you were more of a bench or a clinical scientist. But in consulting, they don’t really know that, so you need to explicitly state your transferable skills. For example, did you manage people? Did you collaborate with postdocs? Did you have any collaboration with leaders in your field? Spelling out all of those different experiences and skills are important to help your interviewers figure out what things they could use from your skill set. Consulting is a very logical next step from academia. When making the transition, I kept thinking it was just a huge step, but it really isn’t that big of a jump. The people who are able to adapt to new situations end up being successful in consulting. Those who are much more black and white and need to have stability and structure don’t tend to find consulting to be a good fit for them. It has been a great move for me and I have really enjoyed it. There are lots of opportunities for individuals just coming out of NIH with a PhD to come over to consulting. Q: I would love to hear about what steps one should take while in grad school – i.e. prepare for a postdoc? seek out writing opps? A: Definitely seek out writing opps if you want to be a writer. As I probably said during our e-chat, find ideas and propose them to publications. Proposals should be just a page long and should include everything the editor needs to know about the story idea: why it is important, why it is new, how long you want to write it, what art would there might be, etc. Or look for an internship. One that you can consider is the AAAS Media Fellowship, which is explicitly created for scientists who are working on a Ph.D. but are now at a point where they want to explore journalism. Q: How competitive is the field of science writing, and how realistic is it to expect job opportunities, etc? A: If youre thinking ONLY of the world of consumer publishing, its hugely competitive, and it just got turned inside out by electronic publishing. If you’re very entrepreneurial, and you’re interested in running your own business as a freelance writer, you can make a go of it. You need to arm yourself with info about how to do that and one way would be to at least use the free listserv at the National Association of Science Writers (NASW) to ask steady questions. Theres also a listserv just for freelancers, but you have to be a member. If you’re looking for a staff job, there aren’t that many opportunities unless your plan is to be an editor. If youre thinking outside the world of consumer publishing, your opportunities are much greater. But my expertise is only in consumer publishing. Q: Articles published in the New York Times science section, for example, vs. Popular Science are quite different. As a researcher, I find that in the NYT things are often exaggerated vs in good science magazines, it’s “sold” to the reader but more realistically. Is there a difference in backgrounds of these various writers? Would a research background be applicable more to one, or not necessarily? A: The difference is the readership and what the readers expect. Your background makes less of a difference than your ability to connect with those readers. If you have a research background, great. But that background only gives you expertise for a particular area. The art of being a science writer is to cover the entire spectrum, and to make a connection with your readers: what they need, what they know. Science magazines, unlike daily newspapers, can count on the fact that their readers are at least interested in science. In a daily general publication, however, that’s not a given. That’s part of the difference behind the tones that you’ve noticed. The publications are serving their readers; they are not serving scientists per se or serving people of particular backgrounds per se. Q: We all hear about journalists’ jobs disappearing. What do you do to keep your work unique in the digital age? A: I make sure I keep up with things. I am now tweeting. I blog from conferences. I carry a BlackBerry, an iPhone and an iPad usually, all at the same time, so I can use them and think about what Scientific American should look like on different devices. (Yes, I need to play with an Android phone and other stuff but even I am only human!) I make sure my mind and eyes are open, but I needed those skills to be a journalist anyway. Imagine doing something for a living where you will NEVER be the expert. You are always the novice, always the student when you are a journalist. Q: If I’m a current PhD student, what actual steps can I take (aside from blogging) to wet my feet? Any internships, programs, or jobs that could break me into this world? A: Yes, lots of them. NASW has a list. Another thing you can do is forget the list and simply write directly to places that you’d like to work for. If they can’t use you as an intern for whatever reason, you might at least be able to visit for an informational interview. If you get one of those, you can ask all the questions you want. But you’d better bring lots of questions; don’t expect the editor to give you a lecture like an academic. Q: What kind of “job track” is typical of someone working their way up to a science-writing job at Scientific American or Nature or Science? A: I don’t think a typical job track exists. Some people have research backgrounds. Some people have journalism backgrounds. Science writing includes both. More frequently these days, science journalists have at least a Bachelors in a science discipline and probably a Masters in science writing. By the way, there are no science WRITING jobs at Scientific American. Most consumer monthlies have only editing jobs. If you want to be a writer, you would most likely be a freelancer. Q: What is the best way to encourage kids in middle school (ages 12-15) to write about science? A: I wish I knew that! I have daughters who are 10 and 14. They think science is cool, because it’s always been in my house. I think one thing that encourages kids is to keep having fun with science. When my girls ask me a question that has some scientific answer, a lot of the time we make a game out of it. What are the questions we need to ask to find out? How would we do that? Or I walk them through the logical chain of events, instead of simply saying the answer. Q: How should you choose a topic to write about? How do you know what the latest in the field is – by reading peer-reviewed journals? A: That’s one way, and a great way. But another is taking advantage of your location to visit scientists who are working on different things. Whenever I take a trip, I try to visit a local institution or two. I ask the public information officers to see if they can get me time with some scientists who are doing interesting things. Another idea is to go to conferences. But the best is to keep your story idea cap on at all times. I know a writer who got a great feature idea while sitting at the vet’s office and listening to an exchange between doctor and pet owner. You can find stories everywhere, if you are open to them. Q: Is it common for those enthusiastic about science to write about health policy issues? A: Not all that common as a narrow category, I suppose, but there’s a lot of call for health writing in general. Q: Given you take the normal scientific career path, what is the optimal time to apply, i.e. after PhD, after postdoc? A: Not sure what you’re applying for here. If you mean for a position as an intern, then I would do that while you’re still in school. If you’re applying for a consumer magazine, anytime is fine. If it’s a journal, they’ll want you to have a Ph.D., but I dont think they will expect a postdoc. Q: Who are some of the big science writers that you admire? A: Gosh, lots. If you look at Scientific American, you’ll see them in our pages. I love people whose curiosity and enthusiasm lights up the pages. I recommend picking up the two Best American Science Writing books each year; the top writers are in there. One of them is best science writing and one is best science and nature writing. Q: Back to the day-to-day description, if you’re working for deadlines, how many deadlines per week, etc., are typical? A: Depends on the job. When I was a daily newspaper reporter in the Stone Age, it wasn’t unusual for me to write three or even four stories in a day. As a monthly magazine editor, I have different kinds of deadlines; each element in an article has to move along. So every little piece of art, all the blocks of text, the pieces that then are going online as the online components, etc. Basically, every day there are three or four things that need to happen, sometimes more. Q: What do science writers typically get health insurance? Is it offered through an organization like the National Association of Science Writers, or do people generally get it individually? A: If you are a freelance writer, you buy your own. The NASW offers group discounts, just because of the number of members who are freelancers, but they’re really still individual purchases. If you work for a corporation as I do, the company has to supply it if you work over a certain number of hours – and you’ll typically pay at least one-quarter to one-half of the total expenses, which are considered part of your compensation. If you’re a freelancer, you should charge rates that take all of your costs into account: for office space, healthcare, supplies, travel, etc. NASW members have access to a database called Words Worth that documents what people have been paid for different types of jobs. Q: What about writing from an office, not from home? Are you still paid “by deadline” and by word count? A: If you’re a freelancer, you’re paid by word or by job. If you’re in an office as a full-time employee, you’re paid by week or hourly. I am an exempt employee, which means it doesn’t matter if I work 80 or 100 hours a week, I still get paid the same. And sometimes I do pull really, really long hours. Q: Would I need to do a postdoc to become a Nature editor? A: I don’t think so. But a Ph.D. is the minimum requirement.